My Take: I can’t believe it took me so freakin’ long to read this totally, awesome, amazing book, and I can’t believe I just let it sit on my bookshelf collecting dust…literally!!! I actually had to dust it off before I started reading it. But as soon as I picked up My Soul to Take, I pretty much read the whole book in one sitting. Yeah, I did go to bed at 2am, but as soon as I woke (while still in bed! ), I picked it back up and finished it. The ending was pure torture! And I’m not talking about a crazy cliffhanger or even about the actual ending of the book. I’m talking about pretty much the last 70 pages where I had tears streaming down my face. And THEN I cried…and then THAT led to sobbing. And just when I thought the sob fest was over, something else would happen and I would start bawling all over again. Before I started reading, I didn’t fully know what this book (or the Soul Screamers series) was about; the only thing I really knew is that several of my blogger friends are absolutely in love with the series, and they all have the major hots for a particular grim reaper. But when I picked up My Soul to Take, I quickly learned that the story was a modern story with some Irish bean sidhe mythology thrown in. Who would have thought that such a story would totally rock…a story with a female who screams and wails when someone is about to die or when someone actually does die? There were more than enough crazy, heartbreaking and horrific moments and twists in My Soul to Take. Some of the twists I put together pretty early on, but several I did not at all see coming! But I have to admit; even when this one particular twist (that I did predict) finally did present itself, it still had a major effect on my emotions. I love the cute romance between Nash and Kaylee! They seem so cute together. But I have to say that it did bother me quite a bit that Kaylee kept insisting that Nash just HAD to be there holding her hand in some parts of the book. I wanted to tell her that she needed to not be so freakin’ needy! But, I did understand that she had some major trust issues. What I loved most about My Soul to Take is that the story moved really quick and it kept me entertained from the first page until the very last! I will be harassing all of my friends to start reading this series. Here are some quotes that had me cracking up that I thought I’d share. “Nash gave you my number?” That sounded suspicious even with sleep shrouding my brain like mist over a cold lake. “He left it on his dresser.” Tod’s voice was smooth and nonchalant, and I could almost picture him shrugging as he spoke. 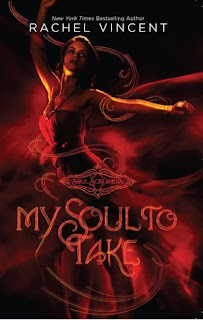 Did you read My Soul to Lose the novella before this? It's really good and has a key part you'll need for later. I'm so glad you read and loved this. I think the concept is cool and unique. I've been re-listening to the audiobook. I've fallen in love w/Nash all over again! I got My Soul to Lose free for my Kindle and that got me started on The Soul Screamer Series. I absolutely adore this series and I never want it to end! Sometimes, by the time an author gets to the 5th book or so, the books start to become predictable or a bit desperate but not this series! I love Kaylee and Todd, Nash and Sabrina and Emma... everyone in the series is so well fleshed out that they feel like friends, doncha think? I loved your review! You summed it up perfectly! Great job! I'm in Rachels challenge but I haven't had time to post my reviews just yet. I haven't reviewed them all but I have most of them! So glad to find another Soul Screamers lover! I just finally read this one recently as well after it sat on my shelf for well over a year. I didn't love it as much as you but I enjoyed it and I think the books will grow on me as I continue the series. Glad you really loved it! I truly love this series and it just gets better and better with each new book! So glad you liked it too! Another rave review on this book! I'm so glad it finally came in the library so I can get it soon. :) Great review!